PARIS, Jul 8, 2014/ — On a bed of shimmering organza, crystal buds are birthed from silk chiffon, whilst a cocktail dress newly blooms with flowers in purple tulle. For Fall-Winter 2014/15, Georges Hobeika, inspired by the timeless work of Claude Monet, paints a woman of grace from the fantasy of dreams. Throughout the collection, nature blossoms in luminous fabrics of dark blue, peacock blue and red. 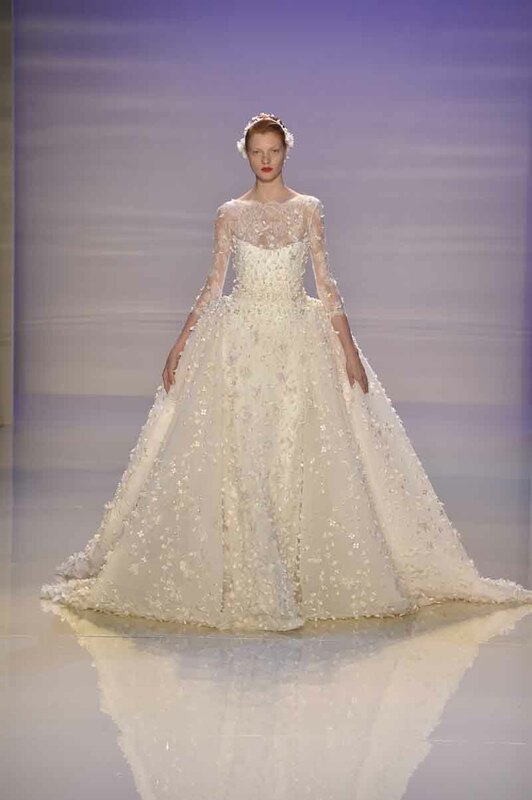 Lines of classic elegance are adorned with poetic elements-such as the delicate, hand-embroidered flowers enriching a bolero or the laser cut, tulle petals embellished with sequins that turn a strapless dress into a bouquet.